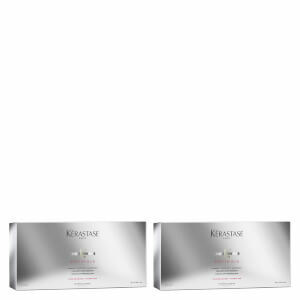 Boost thin and lacklustre locks with the Specifique Cure Anti-Chute Treatment from Kérastase, an intensive 6-week treatment specifically formulated to combat hair loss. Utilising innovative haircare technology, the serum penetrates deep into the fibre to repair and strengthen. Aminexil® 15.000 PPM forms a protective barrier to help prevent heat damage and breakage, whilst Rhamanose® stimulates reproduction of fibroblasts to restore elasticity and suppleness. AOX Complex combines the powerful ingredients of L-Carnosina, Moringa and Vitamin E to act as an antioxidant. With continued used, you can expect glossy, volumised hair with added body and lift. Apply 3 times a week for 6 weeks to dry or towel-dried hair. One dose equals one application. Distribute onto the scalp section by section. Massage with fingertips. Leave in and proceed with usual styling.